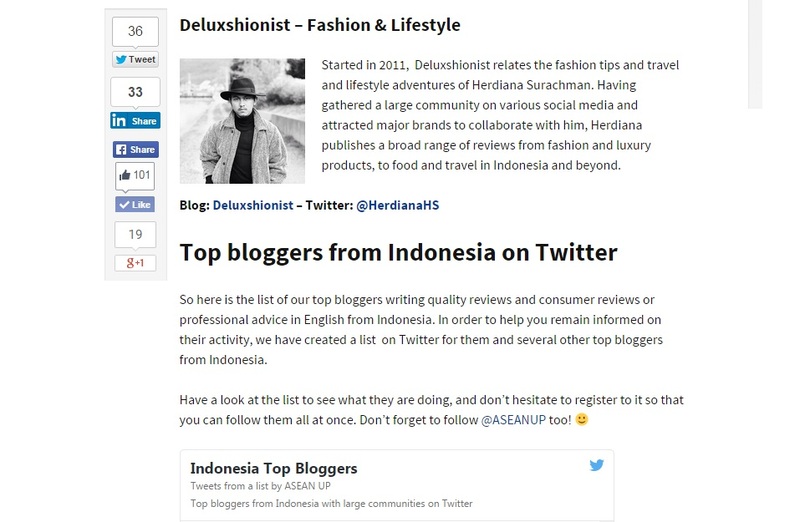 10 TOP BLOGGERS FROM INDONESIA - That's headline popped up on my twitter's notification and saw my profile pictures on it, and yes my blog, this www.deluxshionist.com is featured by ASEAN UP as one of the Top Influencers in South East Asia. So this post I made to say thanks for the honorable mention, listed my name along with well-known Top Fashion Bloggers such as Diana Rikasari, Elle & Jess Yamada & Michelle Koesnadi. It's of course based on ASEAN UP opinion, moreover, it's limited based on English written blogs, but so many bloggers to watch from Indonesia, and for me, as a blogger, you really need to write, dig deeper to create a better content and insight. You could be beautiful, or have so many piles of designers goods, went to so many places with your beautiful Instagram feed, but seriously as a blogger, you need to write and provide more depth of explanation why are the stuff (fashion, places, gadget, food, etc) interesting to talk about, not only it's interesting because you get some cash to write that stuff. For me it is like recognition from bigger point of view, and I am pretty surprised that my personal branding through deluxshionist and its message successfully well-received by readers from bigger community, although I always received emails around the world, never ending press releases from major agency all the time as a prove that deluxshionist reached so many readers from around the world. I might not as popular as Leandra Medine or Bryan Boy (lol obviously), but this is also reminder from me that my influence that I have, big or small through this blog and my social media, it's good to be used for a better missions and intentions, more than just spending countless money for such a temporary lifestyle. So once again, thank you for your support and thanks for ASEAN UP... you should check their website to see another influencer around South East Asia. I support you lho. Sekarang minta uang supportnya, perbulan ya..
Congrats well deserved to be on the list, followed and read your blog since long time ago.